The William Blake Archive is pleased to announce the publication of electronic editions of Blake’s Small Book of Designs copy A and Large Book of Designs copy A; the republication of Blake’s large color printed drawings of 1795, with five additional impressions and all of them now searchable; and the addition to the Blake Collection Lists of the Philadelphia Museum of Art and the Minneapolis Institute of Arts—31 contributing institutions altogether. 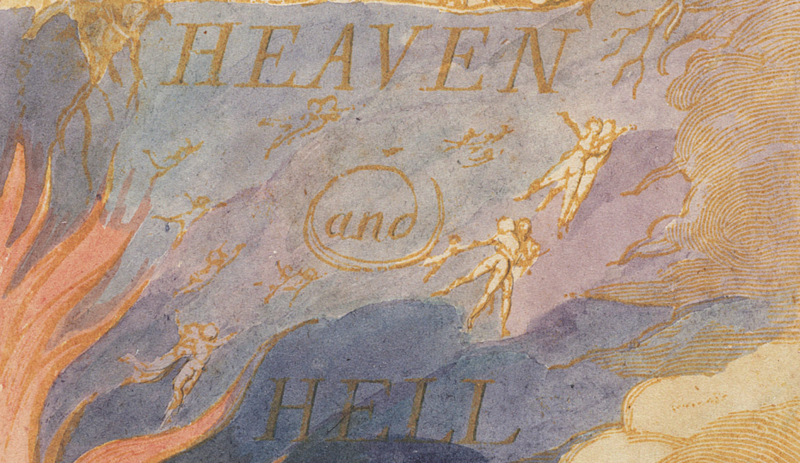 The Archive now also features newly revised textual transcriptions for Blake’s descriptions of his illustrations to Milton’s “L’Allegro” and “Il Penseroso,” as well as updated Help documentation that reflects the launch of the Virtual Lightbox and recent improvements to the Archive’s search engines. The Small Book and Large Book were commissioned in 1796 by Ozias Humphry, a renowned miniaturist painter, and are now in the British Museum. The Small Book consists of 23 plates from The First Book of Urizen, The Marriage of Heaven and Hell, The Book of Thel, and Visions of the Daughters of Albion. Blake masked the texts on these relief-etched plates and beautifully color printed the designs on 26 x 19 cm. leaves of Whatman paper. 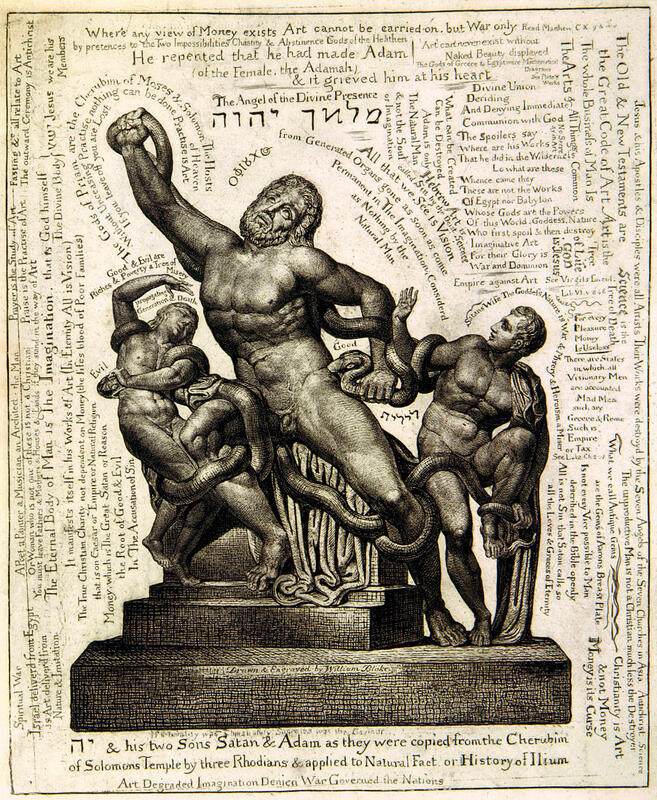 The Large Book consists of eight color printed impressions pulled from etchings (Albion rose and The Accusers of Theft, Adultery, Murder) and relief etchings, including plates from Visions and Urizen and the separate relief plates of America a Prophecy plate d and Joseph of Arimathea Preaching, on the same type of paper, cut to 34.5 x 24.5 cm. With the Archive’s Compare feature, users can examine the prints in the Small and Large Books of Designs with impressions from the illuminated books in the Archive. 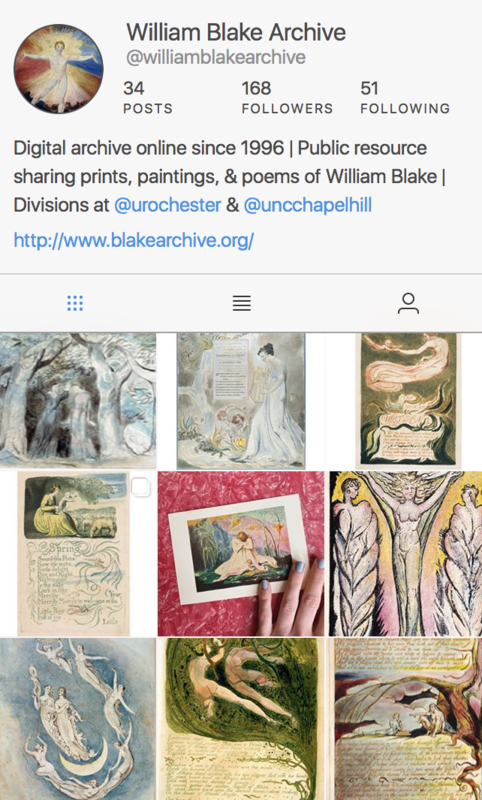 The Small Book and Large Book can be found in the Archive by moving through the following categories: Table of Contents >Works in the Archive >Separate Prints and Prints in Series >Designed and Engraved by Blake. The Small Book was literally a book, its leaves bound through three stab holes, but the Large Book is a “book” only by analogy, for its leaves were neither stabbed nor, apparently, bound. Aesthetically, the Books grew out of Blake’s twelve large color printed drawings of 1795. Although at least one of the designs, God Judging Adam, shows evidence of having been color printed from a copperplate etched in relief, the other eleven appear to have been painted within pen and ink outlines on gessoed millboards (a thick cardboard) and printed onto large sheets of damp wove paper using a rolling press. From such a prepared matrix Blake was often able to print two impressions (a first and second pull) without repainting the matrix, and he finished all impressions in watercolors and pen and ink. He appears to have produced thirty impressions from the twelve designs in at least two printings, c. 1795 and c. 1804-05. No design has more than three extant impressions. As with the illuminated books, each impression is different due to variations in color printing and finishing. For a full technical description of Blake’s large color prints and their relation to the illuminated books and Small and Large Books of Designs, see Joseph Viscomi, “Blake’s ‘Annus Mirabilis’: the Productions of 1795,” Blake/An Illustrated Quarterly (Fall, 2007): 52-83. The Archive has already published in its Preview Mode a selection of 23 impressions of the large color printed drawings (at least one impression of each) and the small version of Pity printed from a different matrix. With this republication, the Archive adds five impressions of five designs: Newton (Lutheran Church in America), never before reproduced in color, God Judging Adam (Philadelphia Museum of Art), Nebuchadnezzar (Minneapolis Institute of Arts), Satan Exulting over Eve (Tate Collection), and Naomi Entreating Ruth and Orpah to Return to the Land of Moab (Fitzwilliam Museum). The Archive now contains all extant impressions of the twelve designs except the last impression of Hecate, or the Night of Enitharmon’s Joy, in the National Gallery of Scotland, Edinburgh, which declined the Archive’s request for a high-resolution image. With this republication, all the impressions of the color printed drawings are searchable and their illustration descriptions accessible, enabling users to engage in detailed, specific, and reliable searches of motifs, objects, subjects, and gestures.